Nice promo from Jon Gruden. Can’t hurt on the recruiting trail. Northwestern doesn’t really care if you can play football, young man. Trust me, this is the most epic thing you’ll read all day. Leave it to Nick Saban to describe the job of the guy who was named the 2010 Rivals.com Recruiter of the Year, made $350,000 a year as an assistant coach at Washington and is the latest addition to the multitude in Tuscaloosa as “… an intern that helps us some in recruiting”. How badly does professional basketball want to keep early entries out? Badly enough to consider bribing subsidizing student-athlete compensation. I do believe people are starting to freak out a little over unionization and the NCAA’s perceived incompetence. Maybe that was Emmert’s plan all along. Crazy like a fox! Ohhhhhhh… you thought they were talking about Aaron’s employment opportunities. 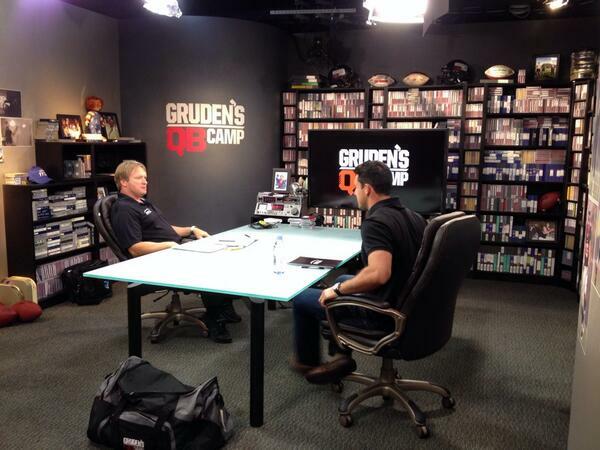 AM’s appearance on Gruden’s QB Camp is scheduled for tonight, by the way. Based on the clip I saw yesterday, it looks like he’ll be breaking down some plays from last season. UPDATE: I take it this is a compliment. Gruden on @aaronmurray11 in relation to other QB's he's analyzed the last 5 years with his QB camp: "He's at the top of the food chain." More Gruden on @aaronmurray11: "He's got deep ball accuracy, He's got tremendous anticipation & touch… He'll be the steal of this draft." Well, now, here’s a surprise: nobody really liked coaching Georgia’s special teams last season. In previous seasons, the field goal team would have basically just been Friend’s unit and the field goal block team would have been Rocker’s. Other assistants were supposed to help, but it often didn’t work out that way, Lilly admitted. It’s nice they’re trying to address the problem, but where the hell was the accountability last year when special teams play was such a hot mess?